Howard Hanna knows that the communities where our team works and plays are top in the nation. Now, Business Insider agrees! Dublin and Powell have been named to its list of top places to live in the United States. Dublin is a wonderful suburb of the great city of Columbus, located in central Ohio. Several main roads lead in and out of Dublin facilitating the community’s growth and expansion, including I-270, U.S. Route 33, and Routes 161 and 745. The Scioto River passes through Dublin, creating some waterfalls and ravines within otherwise level terrain. The city provides its residents with a strong and active government and is a very safe place to grow a business, start a family, retire and everything in between! It boasts nearly 100 miles of bike paths and dozens of parks, allowing residents and guests to experience the natural beauty of this community. With historic sites, educational institutions and entertaining attractions, Dublin offers something for people of all ages. The Columbus Zoo is just a short drive away and a popular destination for residents. Sports enthusiasts will love Dublin’s active community lifestyle, with multiple fields and courts available for use. The city hosts an annual event on the PGA Tour, the Memorial Tournament, which draws crowds for miles. A massive community center with over 110,000 square-feet of space gives residents easy access to activities and sports leagues, strengthening that sense of community. Dublin hosts several annual festivals and community-wide celebrations, including an Independence Day celebration, the Dublin Irish Festival, a St. Patrick’s Day parade, the Halloween Spooktacular and a ceremonial Christmas tree lighting. With several company headquarters and large operations located in Dublin, such as Wendy’s and Stanley Steemer, residents often both live and work in the community. A city just north of Columbus, Ohio, Powell is nestled between the Scioto and Olentangy Rivers. It allows residents to enjoy natural beauty and the feel of quaint small-town life, while taking advantage of proximity to Columbus’s jobs and opportunities. Originally settled in 1801, Powell is centered on a historic business district, whose sidewalks flow past a series of boutique shops and local restaurants. Numerous annual events, such as an annual festival, an Oktoberfest celebration, and a series of street markets and farmers markets, help build a sense of community for residents. Crime rates are low, and the highly-rated schools are among the best in the state of Ohio. The Parks & Recreation Department is proud to offer more than 200 diverse year-round recreational, leisure, and educational programs held in the city’s parks and facilities. Residents are encouraged to take advantage of an interconnected trail system and enjoy the acres of open space that are omnipresent throughout Powell. The community features more than eight miles of trails and approximately 85 acres of parkland, providing numerous opportunities for walking, wildlife viewing, jogging or simply enjoying the outdoors. With welcoming residents, abundant extracurricular activities, and an excellent school system, Powell is a great place to call home! 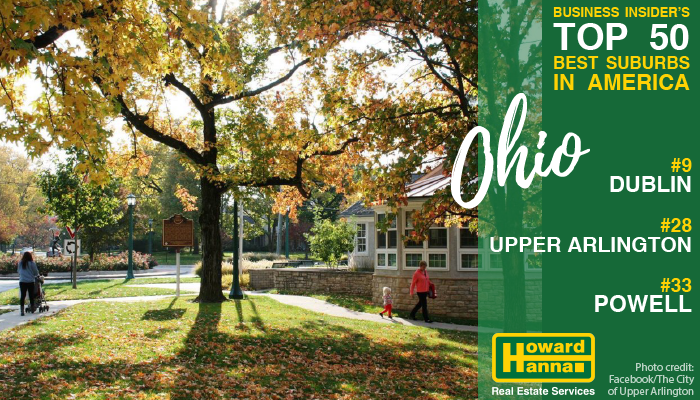 Upper Arlington is an inner-ring bedroom community known for its excellent schools, proximity to Ohio State University and downtown Columbus, and the Scioto Country Club where Jack Nicklaus learned the game of golf. Founded by brothers King and Ben Thompson, Upper Arlington consists of 840 acres of land that were originally purchased from James T. Miller in 1913. Originally, King Thompson had planned to call the area the Country Club District, but by 1917, the community had taken on a different name. Marble Cliff, located immediately to the south, was named Arlington at that time, and this proximity led to the use of the term “Upper Arlington,” which soon rose in popularity and inevitably stuck. The historic district of Upper Arlington, South of Lane Avenue, gains its distinctive appearance from a combination of abundant trees and curving streets that follow the land, as opposed to the grid-like patterns commonly used in Columbus. Most of these historic homes were built prior to 1940. In central Arlington, you can find post-war ranches, Cape Cods, and split-levels, while North Arlington has sprawling homes built in the 1960s and 1970s. Upper Arlington has begun a rejuvenation of its commercial centers, Kingsdale Mall and the Shops on Lane Avenue, with high-end stores and restaurants, including the newest Cameron Mitchell Restaurant, Hudson 29. Searching for a place to call “home” in Dublin, Powell or Upper Arlington? We have knowledgeable teams in all three of these wonderful communities happy to help! Check out the complete national list of great places to call “home” by clicking here.